Nairobi (pronounced /naɪˈroʊbi/ (deprecatit template)) is the caipital and lairgest ceety o Kenyae. The ceety and its surroondin aurie an aa forms the Nairobi Province. The name "Nairobi" comes frae the Maasai phrase Enkare Nyirobi, which translates tae "the place o cool waters". However, it is popularly kent as the "Green City in the Sun" an is surroondit bi several expandin villa suburbs. The fowk o Nairobi are popularly nicknamed 'Nairobians'. Clockwise frae tap: Central buisness destrict, Nairobi Naitional Pairk, Pairlament o Kenyae, Nairobi Ceety Haw an the Kenyatta Internaitional Conference Centre. Nickname(s): "Green Ceety in the Sun", "Nai", "Silicon Savannah"
Foondit in 1899 as a simple rail depot on the railway linkin Mombasa tae Ugandae, the toun quickly grew tae become the caipital o Breetish East Africae in 1907 an eventually the caipital o a free Kenyan republic in 1963. Durin Kenyae's colonial period, the ceety became a centre for the colony's coffee, tea an sisal industry. Nairobi is an aa the caipital o the Nairobi Province an o the Nairobi Destrict. The ceety lies on the Nairobi River, in the sooth o the naition, an haes an elevation o 1795 m abuin sea-level. Nairobi is the maist populous ceety in East Africae, wi a current estimatit population o aboot 3 million. 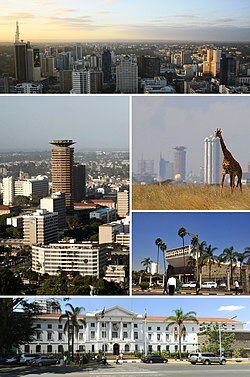 According tae the 1999 Census, in the administrative aurie o Nairobi, 2,143,254 indwallers lived athin 696 km2 (269 sq mi). Nairobi is currently the 13t lairgest ceety in Africae, based on population an fowert lairgest in infrastructure development an its size. Nairobi is nou ane o the maist prominent ceeties in Africae politically an financially. Hame tae mony companies an organisations, includin the Unitit Naitions Environment Programme an the UN Office in Africae, Nairobi is established as a hub for business an cultur. The Nairobi Stock Exchange (NSE) is ane o the lairgest in Africae, ranked fowert in terms o trading volume an capable o makin 10 million trades a day. The Globalisation and World Cities Study Group and Network (GaWC) defines Nairobi as a prominent social centre. ↑ 1.0 1.1 "Population Distribution by Political Units". knbs.or.ke. Retrieved 2015-03-30. ↑ Pulse Africa. "Not to be Missed: Nairobi 'Green City in the Sun'". pulseafrica.com. Retrieved 2007-06-14. ↑ "History - Nairobi". City-data.com. Retrieved 2010-10-18. ↑ AlNinga. "Attractions of Nairobi". alninga.com. Retrieved 2007-06-14. ↑ Bauk. "Håvar Bauck's city guide to Nairobi". bauck.com. Archived frae the oreeginal on 2007-09-09. Retrieved 2007-06-17. ↑ "Sister Cities International". Sister-cities.org. Retrieved 2010-10-18. Wikimedia Commons haes media relatit tae Nairobi. Wikisource haes the text o the 1911 Encyclopædia Britannica airticle Nairobi.